101 years since the October Revolution | Fight Back! The October Revolution and some lessons for the struggle for socialism in the U.S.
To mark the anniversary of the October Revolution - by our calendar Nov. 7, 1917 - Fight Back News Service is circulating the following paper by Freedom Road Socialist Organization. This paper prepared collectively by the central leadership of Freedom Road Socialist Organization, and was presented by leading member of FRSO, Frank Chapman, at the Centennial Commemoration of the October Revolution, held in New York City, July 2017. The event was sponsored by People’s Response for International Solidarity and Mass Mobilization (PRISM) in cooperation with the U.S. member organizations of the International League of People’s Struggle (ILPS-US). As communists and revolutionaries, we welcome this opportunity to mark the 100th anniversary of Russia’s 1917 October Revolution, and to discuss its ongoing relevancy to the struggle today. The October Revolution was a world-changing event. At one stroke, it settled the question of whether another world was possible. Releasing one-sixth of the world from the chains of wage slavery, it smashed the myth that rule by the few was a sort of permanent condition, and, by successfully establishing proletarian political power, the October Revolution succeeded in opening the road to socialist construction. For the years that followed, the great achievements of the Soviet Union created a new and better way of life and would exercise a powerful effect on working and oppressed people around the globe. Not only did the October Revolution change the lives of the millions who lived in what would become the Union of Soviet Socialist Republics (USSR), it changed the world revolutionary movement in a big way. Mao was later to say, that the October Revolution sent the “salvos of Marxism to China” where it was to become a powerful force in the movement for national liberation and socialism. 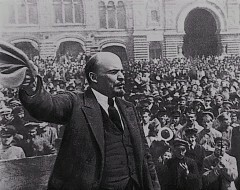 In the U.S., the October Revolution came to exercise a magnetic pull on the revolutionaries in the socialist, labor and other people’s movements, contributing to the creation of a single, revolutionary Communist Party in the early 1920s, which became an important factor in the country’s political life. How we can learn for the October Revolution in the U.S. The Bolsheviks, under the leadership of Lenin, Stalin and others, creatively applied Marxism to the concrete conditions of Russia. In doing so they waged a consistent struggle against opportunism in the socialist and labor movements - internationally and in Russia itself. It was this struggle against opportunism that prepared the Bolsheviks to lead the working class in the seizure of power. The October Revolution was a qualitative leap, from one historical epoch to another – a period in which moribund capitalism is heading for extinction and where socialism is on the agenda. This process in turn gave rise to Leninism; Leninism being Marxism in the era of imperialism and proletarian revolution. Marxism-Leninism is a science, the science of revolution. It allows us to understand the laws that govern the processes at work in the world, and by understanding those laws, including those of how history develops, we can grasp the necessity and understand our freedom to change the world. Because Marxism-Leninism is a science, a science that is by necessity and fact, universal in character, we can take the lessons of the October Revolution and learn from the experience in a materialist way that helps us to advance our work in the U.S. Lenin made the point that the soul of Marxism was a concrete analysis of concrete conditions, so we cannot say that it something that is fixed, static, or immutable. Rather, Marxism-Leninism is and will be constantly enriched through cycles of practice, and the summation of that practice. We learn from the past, to guide our work in the present and to serve the future, which includes our revolutionary goals. We have no desire to be a historical reenactment society, and it should be obvious to all serious people that we cannot rely on analogies from Russian history to understand current conditions. The U.S. today is empire in decline, beset by contradictions internal and external. Lenin stated imperialism was capitalism in its moribund stage, and it is arguable that the irrational bigot Donald Trump is a fitting political representative of a sick and dying system. Internationally, the U.S. faces a growing challenge for the national liberation movements and the national democratic governments, the socialist countries, and other imperialist rivals. Thus, the U.S. is increasing military spending, taking hostile actions against socialist Korea and Cuba, and is stepping up the U.S. wars in Afghanistan, Syria, Yemen, Somalia, Iraq and other places. Within the U.S., the monopoly capitalists are perusing an agenda of austerity and reaction, which means an intensification of racist discrimination and national oppression, directed at African Americans, Chicanos and Latinos, Arab and Asian Americans, and indigenous peoples including Pacific Islanders. There is an attack on the standard of living of working people (including wages, health care, pensions, and perhaps most importantly - the right to have trade unions), attacks on the rights of women, and organized bigotry against Muslims. The point here is not do draw up a comprehensive list of the crimes being committed by the monopoly capitalist class, nor is it to chart the restructuring of the economy and political polarization that has unfolded since the great economic crisis of 2007, rather it is to provide a general picture of a wide-ranging war that the bourgeoisie is waging on the people of the U.S. and by extension, the peoples of the world. Fortunately, the war that the rulers of the U.S. are waging on working and oppressed people is not a one-sided one, and we are now in the midst of one of the greatest upsurges of struggle since the 1960s. In cities across the country, massive and militant protests have taken place against police crimes and there is a growing movement for community control of the police. There is a growing tide of anger over the anti-immigrant polices of the Trump administration. Trump’s attempted ‘Muslim ban’ drew hundreds of thousands of people into the streets and airports. It is estimated that about 20% of the people of the U.S have taken part in protests and demonstrations since Trump took office. Finally, there another point concerning objective conditions that bears mentioning: the communist movement in the U.S. is small. This does not negate the fact that the existing Marxist-Leninist organizations have not made big contributions to the people’s struggle. We have. Rather it is recognition of the reality that the U.S. is a large country with big working class, and for those of us who are revolutionaries, the task of building a new communist party remains on our agenda. At any given time, communists have three general tasks: to win all that can be one in the struggle while landing the strongest possible blows on the enemy; to raise the general level of consciousness and organization among the people; and to build communist organization win the advanced to Marxism-Leninism. As we carry out these tasks there is an incredible amount that we can learn from the October Revolution and the work by Russian communists to make it a reality. Given that no ruling class, be it the capitalists and landlords who ruled Russia in 1917, or the monopoly capitalists who rule the U.S. today, have ever left the stage of history voluntarily, working and oppressed people need to be organized to take political power by whatever means necessary. This is basic lesson of the October Revolution that is universally valid. If there is to be a revolution, there must be a revolutionary party. Without a revolutionary party, without a party built on the Marxist-Leninist revolutionary theory and in the Marxist-Leninist style, it is impossible to lead the working class and the broad masses of people in defeating imperialism and its running dogs. (MSW Vol 4, p. 284). Our organization, Freedom Road Socialist Organization (FRSO), does not claim to be the party of the working class. We are a communist organization that is working to build a new communist party. The reason we do not claim to be the party is that we do not in any real way, to use Stalin’s formulation, encompass the advanced detachment of the working class. The problem is this: most advanced workers - the activists, organizers and leaders - are not revolutionaries or communists. The active of our class are in one place politically and the communists are in another. There is a gap. A separation. So, we need to fuse Marxism and the workers’ movement. In addition, Lenin and the Bolsheviks also developed measures to consolidate the party – organizationally, politically and ideologically - all of which we can learn from today. Taken as a whole, conditions in the U.S. today are favorable for building communist organization. The large number people who self-identify as “socialists” in the wake of the Sanders presidential campaign is an indicator of this, as is the upsurge of struggle against police crimes, the large-scale protests against Trump, and the openness in the labor movement to class-struggle unionism. Also, coming off the economic crisis of 2007, and the restructuring of the economy that has taken place since then, there is a sense among many, especially among young people, that capitalism is a failed system. In all of the people’s struggles, the issue of “Who will lead?” is a basic one. Communist leadership is not preordained. It is earned, though our clarity of political line, organizational capacity and hard work. Communists need to be good at learning at the same time as we teach others. We cannot afford to criticize from the sidelines. We need to step up, and if we do not do so, opportunists of various stripes will be glad to do it for us. For example, objectively speaking, there is a movement against Trump. It began while he was on the campaign trial, and many of us marched against him and his agenda in the streets of Cleveland during the Republican National Convention. There was a huge outpouring of struggle, which was largely spontaneous, following his election, and we are now in a period where large-scale fightbacks can be organized against his more egregious attacks – such as the Muslim ban. In building the movement against Trump, we need to contend with reformists and other class forces, including those tied with the leadership of the Democratic Party, over the issue of who should lead. The fact is the only way we can lead this movement is by being the ranks of those who are the practical organizers of it – which means that we are among those calling the demonstrations, organizing the big protests, and are among the speakers putting out a clear line on the issues of day. To the extent that we can, we want the movement to target not only Trump, but also the monopoly capitalists who stand behind him. In this struggle, like every other popular movement, is critical for communists do more than work to raise the general level of consciousness among the masses of people, and we can’t be content with being the among the best of the activists either. In every battle that we engage in it is critical we are summing things up with the activists and leaders, helping them understand the laws the govern monopoly capitalism, and explaining the need for socialism. By doing this we grow the communist movement in this country, and lay the basis for creating a new communist party. It should also be noted that this work of building communist organization in the crucible of the day-to-day struggle helps to create the material basis for Marxist-Leninist organizations, to engage in joint practice, to engage in summation, and, where possible, to the achievement of principled organizational unity. All revolutionary strategy is based on answering the question, “Who are our friends and who are our enemies?” This is impossible without understanding the specific features of U.S. society. Our strategy for socialist revolution is constructing a united front against the monopoly capitalist class, under the leadership of the working class and its political party, with a strategic alliance between the multinational working class and the oppressed nationalities at the core of this united front. It is vital to understand the special needs and demands of entire nationalities within the borders of the U.S - African Americans, Chicanos and Latinos, Asian Americans, Native peoples including native Hawaiians, Arab Americans and others, are bound by the chains of national oppression. Racism in the U.S. carries the stench of the slave market. It maintains that Black people are inferior and that racial antagonisms are ahistorical and independent of the development class societies. We totally reject this notion. Lenin referred to pre-1917 Russia as a “prison house of nations,” and that is exactly what the U.S. is today, where racist discrimination and systematic inequality in all spheres of life - economic, political, and cultural - is the order of the day. 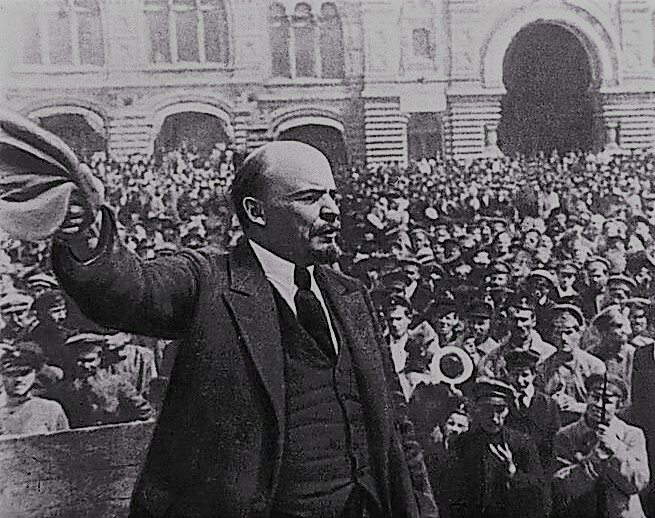 One of the main reasons that Russian Communist Party (Bolshevik) was successful in October 1917 was that it championed the fight against national oppression, and it consistently stood for the national liberation and self-determination. There is a lot we can learn from this experience. Likewise, by waging a struggle against the opportunism and social chauvinism that characterized the Second International, Marxism-Leninism became the revolutionary theory, where the national question takes it rightful place, where is understood where it is in reality - as vital to the revolutionary process internationally and vital to understanding the core dynamics of change in a multi-national state like the U.S. The struggle against imperialism and national oppression is a revolutionary struggle, for just as the people of Asia, Africa and Latin America require revolutionary struggles to overthrow colonialism and liberate their countries, so will it take a revolutionary struggle in the United States to gain full equality for oppressed nationalities. Since it is the system of imperialism that profits from and causes national oppression, only the overthrow of this system can end national oppression. Two things are needed to develop the strategic alliance. First, we need to build the African American, Chicano, and other oppressed nationality movements, and to promote working class leadership with in those movements. Workers from oppressed nations in the trade union movement bring with them the special demands of their national liberation movements. We fight for the trade union movement to stand in unconditional solidarity with the oppressed. Second, as we build the multinational working class movement, we need to ensure that the fight against racist discrimination, and for consistent democracy, and full equality for the oppressed is at the core of our agenda. For example, in recent years the struggle against police crimes has exploded in Black community. In a number of places this struggle has expanded to encompass the fight for community control of police. In addition to building these fights, everything possible should be done to get the labor movement to support them. Or to take another example, we have worked hard to build the immigrant rights movement, to resist deportations and to build the fight for legalization for all. In the cities where we do this, we have worked hard to draw in the labor movement. The work to build this strategic alliance also requires carrying out a set of interrelated and at times difficult tasks. White workers, especially those who are active and forward-looking, have the responsibility to fight white chauvinism or racism among whites and play an active role in building the fight against all manifestations of national oppression. Racial prejudice is not the primary cause of national oppression. It is the consequence, the rationalization and justification of national oppression. Revolutionary-minded oppressed nationality workers have the responsibly to oppose narrow nationalism among workers of their own nationality. Building a united front against monopoly capitalism, building communist organization with the aim of constructing a Leninist party of a new type, or building a strategic alliance are all tasks that can be carried out now. All the basic contradictions of imperialism are sharpening and there is a real urgency to do what must be done. The monopoly capitalists who rule the U.S. also rule an empire that extends around the world. They are parasites and exploiters who rob vast swaths of the globe - hundreds of millions of people - of their labor, land and natural resources. They have built a military machine of an unprecedented scale in world history and the U.S. is waging continuous wars, from the Philippines to Iraq. They have placed Puerto Rico under colonial rule and block its path to independence. And they make the Zionist occupation of Palestine possible. The people of the U.S. and peoples of world have something in common, a common enemy. Every blow that the people of the U.S. land on our rulers is good for people everywhere, and vice versa, and this is the material basis for proletarian internationalism, for the unity of the working class and for oppressed nations on a world scale. Living in the center of an imperialist empire, revolutionaries have a special responsibility to oppose the wars of our ‘own’ rulers and extend support to the oppressed. As we do so there is a great deal that we can learn from the determined fight that the Russian communists waged against the social chauvinists, i.e. those who were socialist in words, but “great nation chauvinists” in deed. As we build the anti-war movement we constantly encounter those who what to join the in demonization of the national liberation movements. We cannot let these forces set the terms of the movement. Along a similar vein, we can never accept the imperialists’ attempts to criminalize the national liberation movements with their slanders of terrorism or narco-terrorism, and we oppose their laws that seek to outlaw international solidary. The October Revolution opened the road to a new stage in human history that shows what our class can do – that we can “lose our chains.” Revolutionaries in the U.S. have a big job and we are well served by using the science of Marxism-Leninism and learning from advanced experience. Monopoly capitalism is a failed, criminal system that had a beginning and that will surely have an end. Its gravediggers are already on the scene. And while we do not know the year or month – we are certain the U.S. will have its October.